If you are thinking of planning a trip to Israel in the future, Michelle is happy to assist you. She offers itinerary planning options, or her services as a certified Israeli private tour guide. The tours can be specialized to fit your schedule and budget as well as your personal interests and preferences. Some possibilities include: religious and historical sites, nature reserves and national parks, biking tours, spas, wineries and cooking tours or some combination of these things and more. 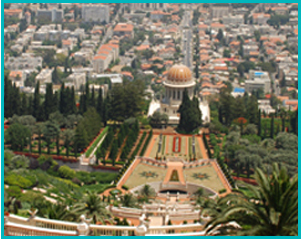 Shalom Israel Tour - usually for people visiting Israel for their first or second time. This includes the most important religious, cultural, and nature sites in Israel. Bar/Bat Mitzvah Tours - For families celebrating a Bar/Bat Mitzvah. Golden Age Tours - For Seniors - a slower paced tour mainly for people over 60. ECO Tours - Visiting some of the numerous nature sites in Israel, and discussing current environmental and water issues, such as the water crisis in Israel today. SPA Tours - Hit some of the best spas in Israel in the Galilee, Coast, Dead Sea, and Eilat while touring along the way. Cooking Tours - These include sampling the best Israeli cuisine, visiting boutique wineries, marketplaces, and even cooking classes to learn some of the local dishes. Water Tours - COMING SOON... Specialized Water Tours of Israel for academics, governmental and non-govt organizations, and water engineers. Visit desalination plants, waste water treatment centers, government agencies and more. More Details coming soon. Contact Michelle for more information at michbrocco@yahoo.com.